Stop the LeBron hating? Are you kidding. As I’ve listened and read Heat fans reactions to the team’s 2nd championship, a consensus seems to have emerged that we want LeBron haters [see a partial list here] to stop their criticisms. This short-sighted reaction saddens me. The genesis of such thinking is likely one of the ugly manifestations of living in a Nanny State [it’s unfair, whaaa]. It shows a real lack of understanding of what it means to be a fan and where the most joy can be derived from that experience. The notion that we wish others to stop their hating now is absurd. Now!? At the very moment when the stars have aligned for us to mercilessly mock them all the way into their eventual graves [on which we should be placing James trading cards, not 1, not 2 …]? Heat fans please understand that we have nothing less than a moral obligation to never allow any LeBron hater to attempt to pivot from said hatred. There will come a time [in the affairs of men] when the LeBron offender will attempt to say, ‘hey, can we move past this?’ The Heat fan answer must be no. At that moment, Heat fans should behave as human DVRs, by replaying their transgressions of disbelief [accuracy should not be a factor]. The only people who should be answering yes are reasonable people. But then again, those types know shouldn’t be involved in the discussion to begin with. The moral clarity required to point that foam finger without a conscious is not a way of life for all. 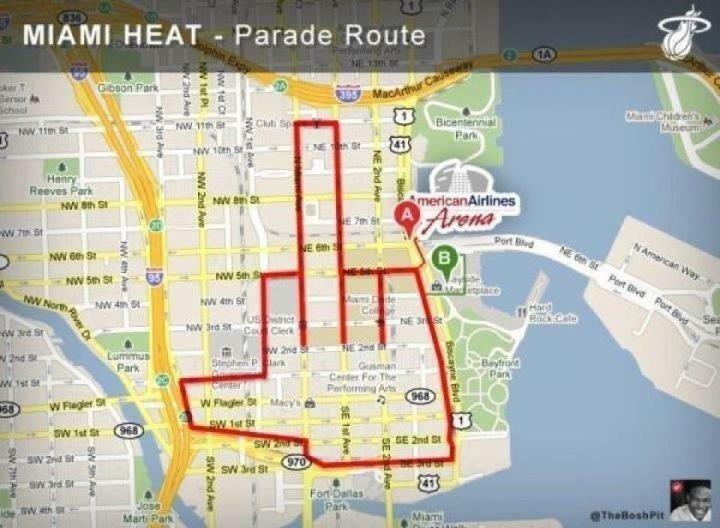 H/T to Q’s friend for the inspired parade route. This entry was posted in Sports and tagged Iron Eyes Cody, LeBron James. Bookmark the permalink. Jordan went to his first final and won it at 28 years old. He proceeded to win 5 more… Lebron has been to 3 and won his first by the age of 27! Put on your seat belts we are on for a hell of a ride! Agreed….the cruel beauty of being on the brink of elimination- especially down 3-2 to Boston, is that it emboldened the Haters to come fully out, to shed any thinly veiled semblence of impartiality, and come into the” Light “as it were. That Light is the open stage, the unfiltered proclamation of pure venom. No longer can they hide behind implied meanings. They showed their hand. To be a fan is precisely to leave reason behind, discarded. The root word of ” fan” is ” fanaticism”. So i join you in this noble journey, away from the merciful middle ground of reason. To quote Conan the barbarian, when asked ” what is good in life”: to wit- ” To defeat ones enemies; to watch them being driven away before you; unt, to hear the lamentations of the women”. Your quote, devoid of any human compassion, has moved in a manner reminiscent of a Native American watching vehicles litter non-Interstate highways.